In terms of value, the global natural and organic flavors market is expected to expand at a CAGR of 5.7% during the forecast period (2018–2026) and reach US$ 11,269.7 Mn by 2026 end. Asia Pacific is projected to be the fastest growing market over the forecast period in terms of volume. The significant growth of the North America and Europe market is mainly attributed to an increase in the global volume of natural and organic flavors. On the basis of source, the fruits & fruit juice segment accounted for the largest market share of over 40% revenue share of the overall market in 2018, and is projected to maintain its dominance throughout the forecast period. 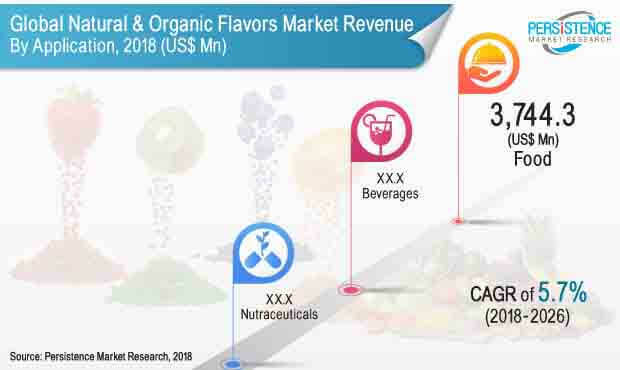 Increasing health consciousness among consumers, rapid urbanization, introduction of new flavors with more sensational taste, growing disposable income, and increasing emphasis on uniqueness in taste with patent in processed food and beverages products are a few of the key trends in the global natural and organic flavors market. In 2018, Europe was the dominating market in the fruits & fruit juice segment followed by North America. This is attributed to consumer preference for ready to drink (RTD) fruit drinks, with natural ingredients. Berries and citrus sub-segments accounted for significant value share among the fruits & fruit juice sub segment. The edible yeast sub-segment contributes healthy revenue to the dairy segment. The plant and botanical segment is also projected to exhibit favorable growth over the forecast period. On the basis of regions, Europe is expected to dominate the global natural and organic flavors market, accounting for significant value share of the overall market. Also, Europe is expected to maintain its dominance over the forecast period as well. In terms of volume, the market in Asia Pacific is projected to be the fastest growing market during the forecast period. Global natural and organic flavors market is a consolidated market, where top five companies hold significant market share. In terms of value, the top ten companies accounted for majority market share in 2018. Currently, natural and organic flavors manufacturing companies are adopting advanced and upgraded version of technologies. Technological advancement is helping companies increase their revenues by increasing the efficiency of natural and organic flavor production. With the introduction of spicy flavors in different edible products, the ample opportunities are unfolded for companies engaged in food related business including natural and organic flavor manufacturers. Average net profit margin of the natural and organic flavors industry is around 15%-20%. The price range for natural and organic flavors is expected to fluctuate between 2018 and 2026 due to factors such as varying production, demand, end stock, import and exports of natural and organic flavors. However, the spices sub-segment is expected to expand at the highest CAGR of 5.8% during the forecast period. The fruits & fruits juice and plant & botanical segments are anticipated to be the highest revenue generating segments during the forecast period. On the basis of flavor type, the natural flavor segment accounted for comparatively higher revenue share in the global natural and organic flavors market and is expected to maintain its dominance through 2026. The essential oils segment is estimated to account for the highest value share by the end of 2016 and is expected to maintain its dominance throughout the forecast period. Increasing application of essential oils in processed food products and beverages are expected to drive growth of essential oils segment during the forecast period. Owing to increasing applications of From The Named Fruit (FTNF) in beverage, the FTNF segment is expected to grow healthy during the forecast period. Givaudan S.A., International flavors & Fragrances Inc., Firmenich SA, Symrise AG, Takasago International Corporation, Sensient Technologies Corporation, Kerry Group Plc., Frutarom Industries Ltd., Robertet SA, Archer Daniels Midland Company, Döhler GmbH, Huabao International Holdings Limited, T. Hasegawa Co., Ltd, Koninklijke DSM NV, Axxence Aromatic GmbH, Gold Coast Ingredients, INC., Zymus International Ltd, Treatt Plc, Blue Specific Flavors, Inc., and Unique Flavors and Fragrances Ltd. are the leading players operating in the global natural and organic flavors market.